Opened box return — product is new with a couple scratches on barrel nut. ?Packaging may have signs of use. 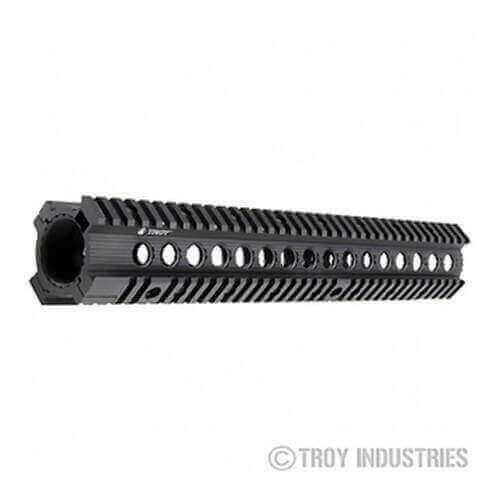 Troy 13.8″ MRF-308 Rail. The Troy MRF is the strongest user-installed free-floating rail system in the world. Troy MRFs are available for all M16/M4 weapon systems equipped with the original factory barrel nut. The MRF’s patented mounting system reinforces the barrel nut with a sturdy clamp and anti-rotation alignment lugs. Troy MRF BattleRails provide an uninterrupted rail extension and hand guard aligned perfectly with the host weapon’s flat-top receiver.